Unpack the best tips for a great vacation along Minnesota’s scenic North Shore. This guide is for RV and tent campers…for seasoned experts and those new to camping…for all who love the outdoors and seek a fun and inexpensive way to get out and play in the great Lake Superior region. Naturalist and outdoors expert Andrew Slade scouted out a thousand campsites along Minnesota’s North Shore, seeking the unique and beautiful places of this spectacular region. The best of the best are included in Camping the North Shore. Stake out an ideal “base camp” so you can enjoy loads of fun activities in the area, including kayaking, hiking…even gallery-hopping! Leave the ordinary behind—camp Minnesota’s North Shore. Camping is not only an inexpensive way to experience the North Shore—it’s also the best way. Let this guidebook get you there. Camping the North Shore can be as simple and pleasant as a cooler-by-the-lake campsite at Temperance River where you relax for a week, read books, shower every night and watch the kids play at the beach. Or it can be a getaway under the tall pines at Baker Lake, a base for a Boundary Waters adventure, with long canoe trips each day and the comfort of your cot at night. Let Camping the North Shore help you find that perfect campsite for the perfect North Shore experience. But wait…there’s S’more! Camping the North Shore includes all the ingredients to help you plan a perfect North Shore experience. Camping the North Shore not only gets you to the right campground, it gives you great ideas of what to see and do when you’re there. Climb to the highest point in Minnesota? Easy when you’re at Devil Track Lake Campground. Berry picking during the peak of summer? Check out Indian Lake. Bike riding for the whole family? Split Rock Lighthouse is the perfect spot. All 23 campgrounds featured include information on fun activities and adventures to enjoy during your stay. Camping on the North Shore is really popular. Learn how to get a great site, even if you don’t have a reservation. Plus, learn about 43 more campgrounds in the region—that’s 66 campgrounds in all! Make a memory in Minnesota’s great Lake Superior region—go camping! Great book. I loved every page and will be spending a lot of time camping there. Great reviews of campgrounds – both state parks and private. Great guide, saved our vacation. This was a very informative guide that led us to places we normally would not of known about. We highly disliked our first choice of campground as it was very close to the road and not at all rustic. Thanks to this book we were able to drive around and view several amazing other options ending up at our favorite one of all (Sawbill Canoe Outfitters). This book also gave us other ideas such as visiting Lutsen Mountains for the alpine slide and hiking. I highly recommend this book if you are going to be visiting the North Shore and want new ideas and nice rustic tent campgrounds that go beyond the state parks. Campers will discover a ton of useful information crammed into this 132-page book. The author, a life-long explorer of Minnesota’s North Shore, not only recommends the best places to camp, but also provides detailed maps and information about each campground. In addition, he offers advice about nearby places to go for a hike, ride a bike, or catch fish for dinner. The 23 campgrounds range from state and municipal parks with amenities like hot showers to primitive, backwoods locations. At the end of the book, the author lists 44 more campgrounds with honest, matter-of-fact descriptions of what you will find at each one. Very helpful camping guide!! I initially checked this book out from our local library, but after reading it decided we should have our own copy. We are tent campers and like to be away from the “big rigs” so really appreciate the details about the specific camp sites. We haven’t camped on the North Shore for years and look forward to being there in a few days!! I can’t comment on how it all turned out, or share photos, as we haven’t been there yet! We have made all of our reservations and can’t wait to be on the North Shore! We will bring the book along! 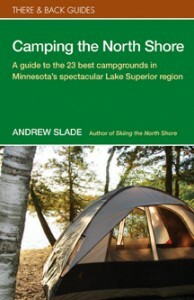 Andrew Slade of Duluth has camped in 27 states and five provinces and is the author of the new Camping the North Shore. His book includes descriptions of campsites on inland lakes and rivers as well as Lake Superior and suggestions on what to do while there: swim the Baptism River, hike the “Lake District,” paddle Crescent Lake. If you’d like to try something new on the North Shore, this is the book to have. A Good Read And Reference For Tenters. This is a good book with a lot of good information in it especially if you enjoy tenting. People with anything but a tent will probably also find good information on places to visit. Camping the North Shore not only guides you to the best of the best, it gives you fun activities and adventures for each location, complete with detailed maps and dozens of photographs. Great camping guide book! Camping the North Shore is the best camping guide book out there because it only covers the best area for camping; the North Shore. This book has info on every single campground on and near the North Shore (over 60!). The 23 best campgrounds each get their own chapter. Each chapter starts with a detailed description of the campground, the campsites, and the vicinity. Next comes info on when the campground is open, the number and type of sites (RV, tent, cart-in, etc), getting a site, making a reservation, facilities, fees, contact info, activities and features. Driving directions and an excellent campground map are also included. Every chapter ends with S’more to See & Do; an entire page or more describing a few unique activities at the particular campground.Should none of the 23 best campgrounds be what you’re looking for, go to the back of the book. There is info on another 43 North Shore campgrounds. Included is enough detail about each one to find the place and to know what you’re getting into.If you like camping and hiking, biking, fishing, canoing, pizza delivery, or shopping, you should get this book. No matter what your interests are, Camping the North Shore will help you find the campground, and maybe even the campsite, that is best for you.